Among the many beautiful, accomplished candidates hoping to be chosen as Sheikh Omar’s wife, shop assistant Beth can’t believe this powerful desert king would even notice her. Yet Omar does select her—and his heated gaze sets her alight, making her innocent body crave caresses she’s only dreamed about! She’s instantly thrown into his world of unimagined luxury, but can this shy Cinderella ever be a queen? A Cinderella story with a royal twist! 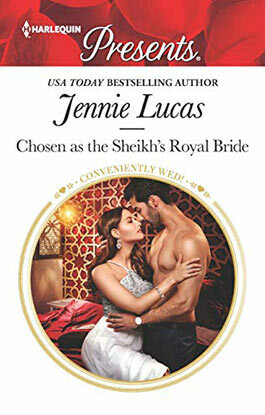 February 20, 2019 - Coming soon - CHOSEN AS THE SHEIKH’S ROYAL BRIDE! Ordinary shopgirl Beth is shocked to gain the attention of a powerful sheikh king who’s brought 20 beautiful, accomplished women to Paris to choose from as a bride. But what will happen when he discovers Beth’s devastating secret - too late? Out March 19, 2019 print / April 1, 2019 digital in the US, and March 7, 2019 in the UK. October 16, 2018 - OUT NOW IN PAPERBACK! (November 1 digital) Lola didn’t dare tell Billionaire Spaniard Rodrigo Cabrera she was pregnant, after he spurned her. But now he’s discovered her secret, he’s determined his child will take his name! The final book in my secret baby trilogy - THE BABY THE BILLIONAIRE DEMANDS! August 24, 2018 - OUT NOW IN PAPERBACK! (September 1 digital) A year ago, a one-night stand with a handsome stranger left idealistic waitress Tess pregnant. Now he's back in New York City and ruthlessly demanding marriage for the sake of their newborn! The 2nd book in my secret baby trilogy - THE HEIR THE PRINCE SECURES! July 19, 2018 - OUT TODAY IN PAPERBACK! (July 1 digital) A ruthless hotel tycoon discovers that his ex-maid secretly had his baby, & he'll stop at nothing to claim them both! The 1st book in my secret baby trilogy - THE SECRET THE ITALIAN CLAIMS! June 15, 2018 - FREE ONLINE READ! The exclusive prequel to my upcoming trilogy is available for free on harlequin.com. New chapters revealed daily! A Greek billionaire discovers the mistress he discarded secretly gave birth to his child in SURPRISE BABY FOR THE GREEK TYCOON. Jennie will send out a newsletter only when she has new books, contests or fun news to share — roughly on a quarterly basis. Jennie’s newsletter is spam-free and private. Signing up is easy, just enter your email address in the form below. JennieLucas.com will never share or sell your info with anyone... period. Nor will you be flooded with e-mails. Jennie's newsletter only goes out when a new book is out (or something major happens). Thanks for your interest! Go ahead, send an email to your friends letting them know about Jennie's books and site. Don't worry about spam -- jennielucas.com does not collect the TELL A FRIEND emails for promotional purposes. Website copyright © 2017-18 Jennie Lucas. All rights reserved. Website design by Web Crafters.